A Perfectly Useless Hobby : Part 2 | Damian Trasler's Secret Blog - Do Not Read! ← Library Renovations are complete! 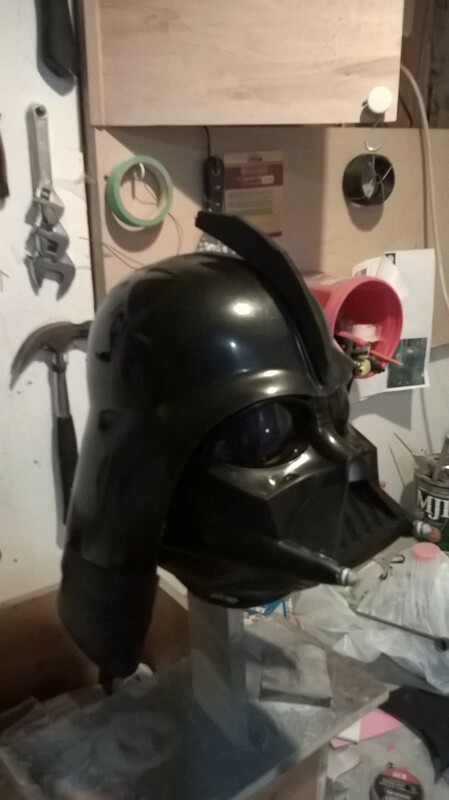 The Shakespearean Vader Helmet: Another insane project begun. It’s nearly the first weekend in April, and that can only mean that FanExpo Vancouver is just around the corner. After last year’s triumph with costumes for the weasels, I was determined not to be left out this year. But the Mando Armour had defeated me. Too many attempts to rebuild had left me dispirited and I abandoned it, leaving the helmet on the shelf with my other projects. Unfortunately for my sanity and the well-being of the family, I had a new bright idea. For my birthday, I received a copy of Ian Doescher’s Shakespearean Star Wars. Worse still, only a day or two later I was wandering through Value Village when I found a Darth Vader Voice-changer helmet, on sale for only $6. Clearly, this was a sign. 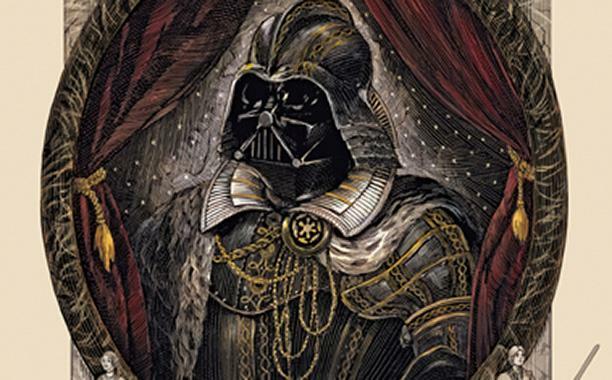 I must make a Shakespearean Darth Vader costume! Adapting the helmet was stage one, and something I could do in short bursts. This was, after all, only September, and there were many months before Fan Expo. The rest of the costume would be easy to put together in the months to come. I took the basic helmet and added extra flanges at the end. Just so I could use the word “flanges”. Years ago, my Dad had a tool that could measure a curve. It was a brilliant thing, but I don’t have one, so I used estimation and an iterative construction and redesign method to create the crest. Mrs Dim says this is actually “Bodging it with trial and error.” She may have a point. Once I’d added the crest, I smoothed over the joins and sprayed it with gloss paint. 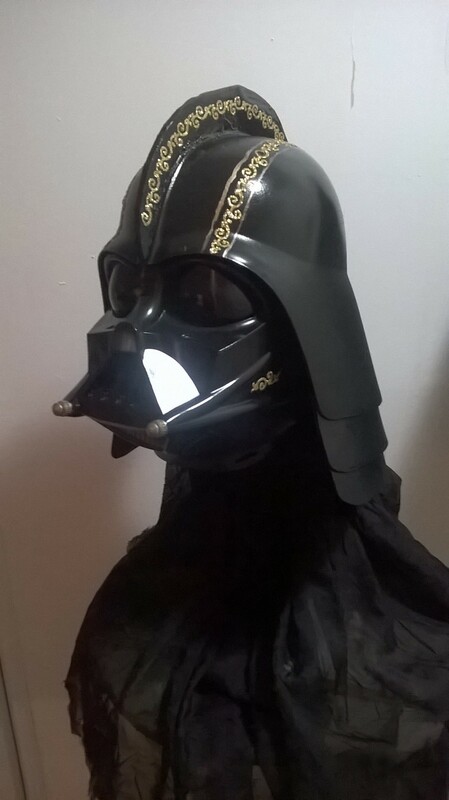 I also sprayed the helmet itself with an artist’s acrylic gloss to make it shine like the movie helmet does – the plastic used for the kids’ helmet is actually too matte. It took a while to find the gold filligree for the decoration. Amazingly, there aren’t many options for self-adhesive gold decoration. I tried all the obvious places, but eventually found something that would do at Michael’s, the craft store. It comes on a roll like selotape, but since the design winds around on itself, it’s much harder to remove from the backing. There was much cursing as I patiently applied each piece, then went back and stuck it back down again a few minutes later. And again a few minutes after that. Then I spent several days finding more bits of gold glitter everywhere. Weeks of work, snatched five minutes at a time, resulted in this replica. Not for Halloween, or Fan Expo, just…because. 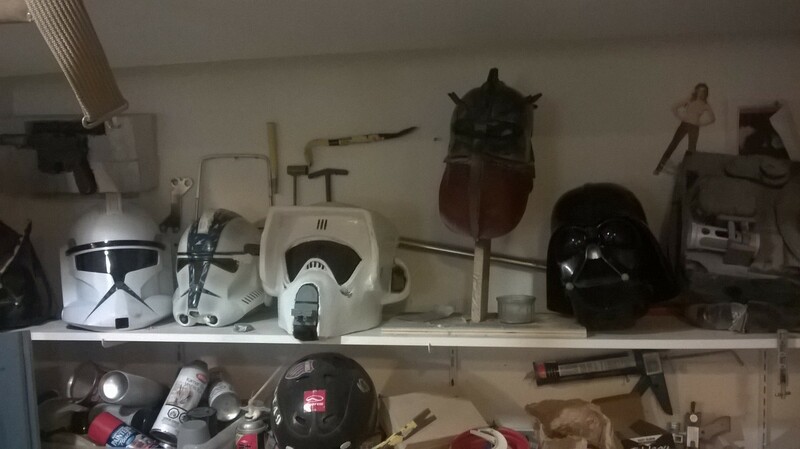 Maybe I should have just said “Helmets are my thing.” They’re easy to display, fun to make and everyone can try them on with no real effort. But I was ambitious, and more than a little jealous of the fun the Weasels had at Fan Expo last year. 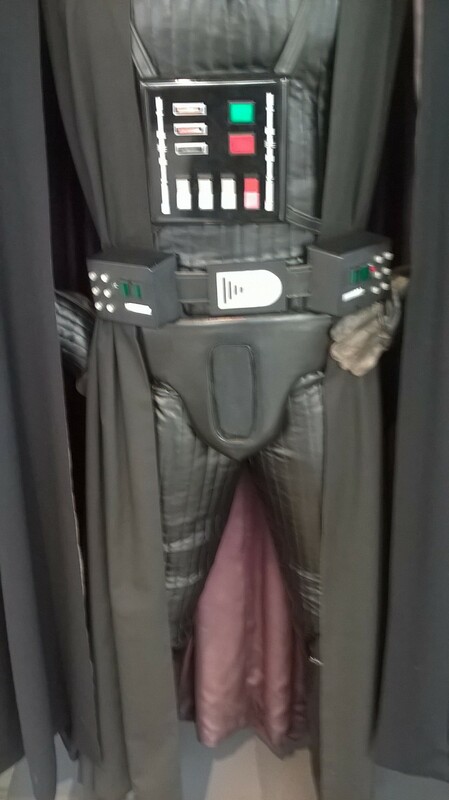 This Vader costume would be a big hit. And besides, I only really needed a breastplate and a decent cloak. 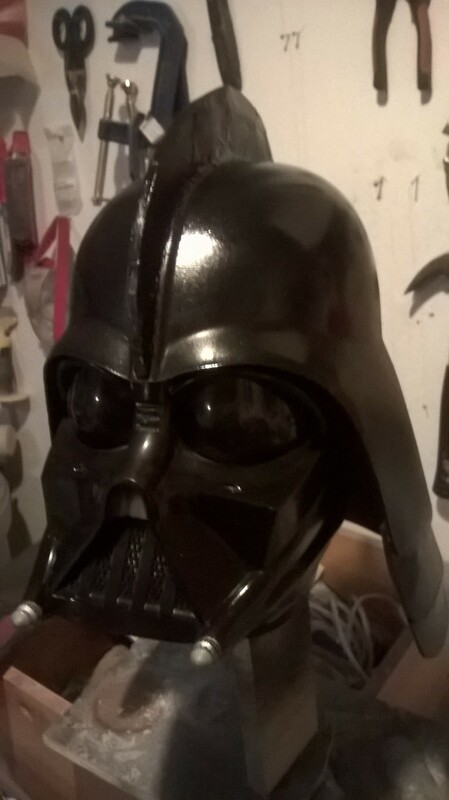 Plus, look, I had a miniature Vader head already, if I sprayed it silver and mounted it on the hilt of my SFX Vader lightsabre…. 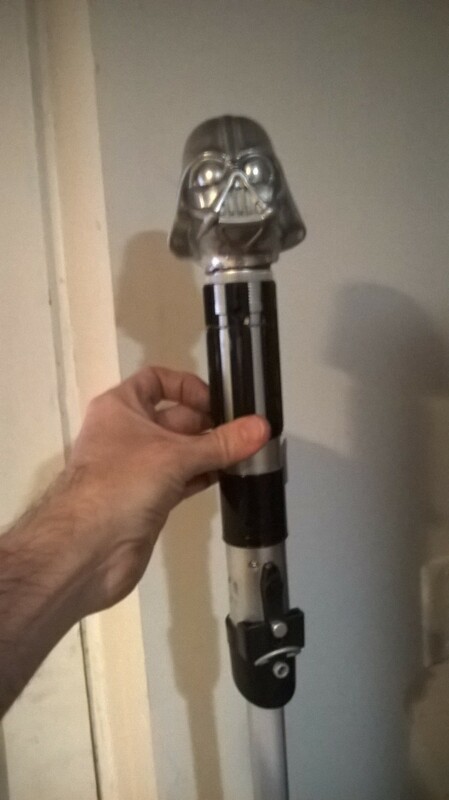 Yes, I already had the lightsabre, why do you ask? Don’t YOU have a lightsabre at home? So fine, I would make the whole suit. I obtained a pair of simulated leather leggings. I already had suitable boots from my Mandalorian outfit. With a black undershirt already in my wardrobe, all I needed was the breastplate and cloak. 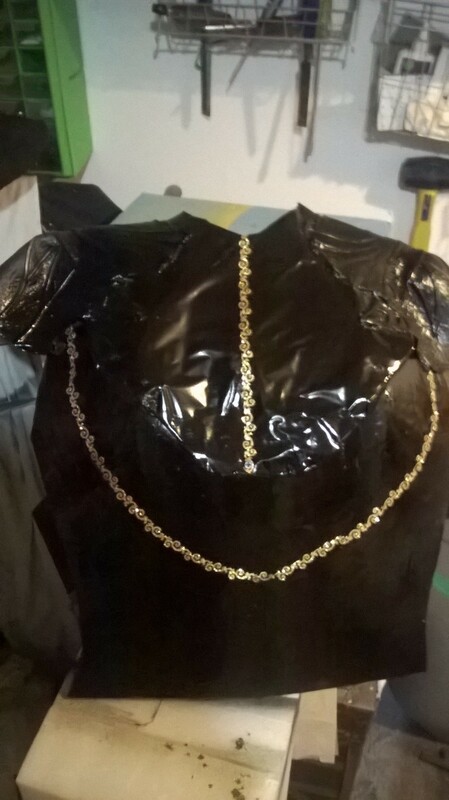 I went to work on the breastplate. The majority of the plate is a foam tile designed for flooring. 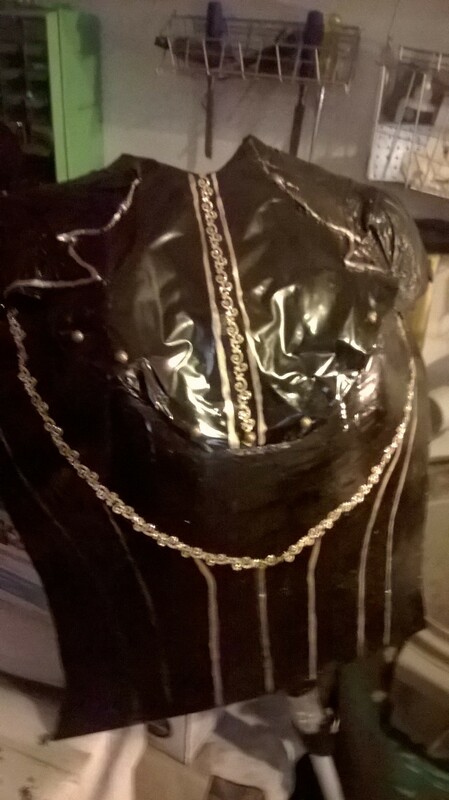 I shaped it a little to bulge impressively over the manly chest I haven’t got, and topped it off with some halloween costume armour for the neck and shoulders. I checked back with the original illustration…. I needed more gold decoration. The chains were easy enough to come by, at Michael’s again. I haven’t added the chains yet. Clearly, this was something else I would have to reproduce…. 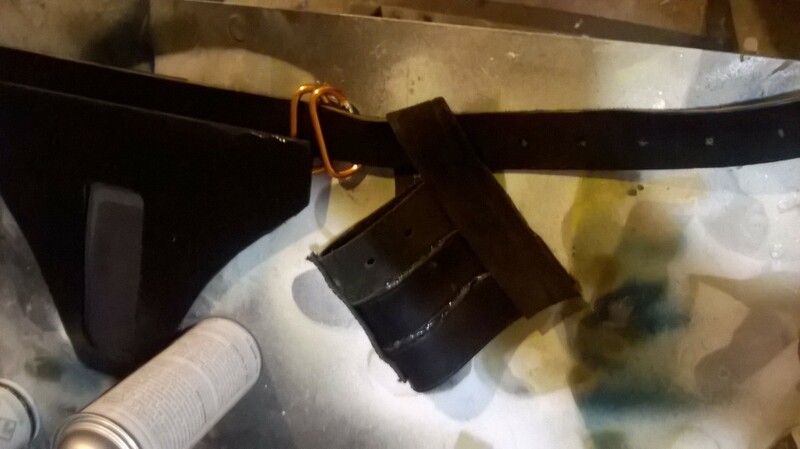 Adding that extra detail turned out to be a good idea, since it gave me a belt I could use to hang a scabbard from, allowing me to carry the lightsabre without having to …er…carry it. I’m guessing you’re waiting for the photo of me wearing the whole rig and posing impressively. Well, there isn’t one of those right now. There’s still work to be done – I have the material for the cloak, but haven’t converted it from curtain to cloak yet. What there was, this afternoon, was some fairly intense discussion on whether this was a useful hobby, because every time I come away from working on the latest project I am frustrated and angry. Mrs Dim points out that hobbies are supposed to be satisfying, or relaxing. She points to her gardening, which is incredibly restorative and has the bonus of producing actual food. Why do I pursue an activity that doesn’t even make me happy when I’m done? The honest answer was that I don’t know. This is something I want to do. More than that, it’s something I want to be good at. As long as I can remember, I have been fumble-fingered, which sounds daft coming from a juggler. But I couldn’t build models. My woodwork made my CDT teacher shake his head sadly. My DIY is done on the “Measure twice, cut once, buy more, get someone else to measure…” method. Practical crafts are not my thing. But I have always been fascinated by the behind the scenes footage of the guys building the models of the Star Wars spaceships or the miniature scenes from “Indiana Jones and the Temple of Doom”. I see the people of Weta Workshops building real Elf and Orc armour and weapons and I long to have a go at that. I tell myself it’s lack of time, or lack of proper materials, or tools, that someday I will be GOOD at this. Maybe that’s true, or maybe I’ll be hopeless at it forever, no matter how much filler I use, or whether I ever get my 3d printer and vacuum former. On the other hand…. I wanted to build a Mandalorian helmet, and I did. 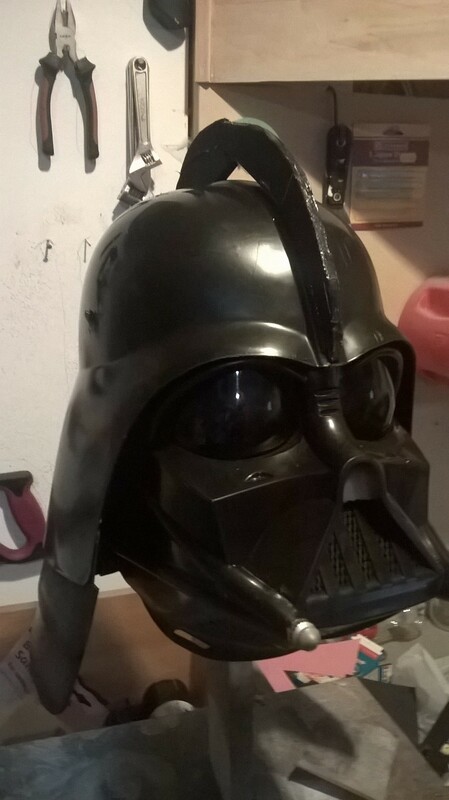 I wanted to build a Scout Trooper Helmet, and I did. 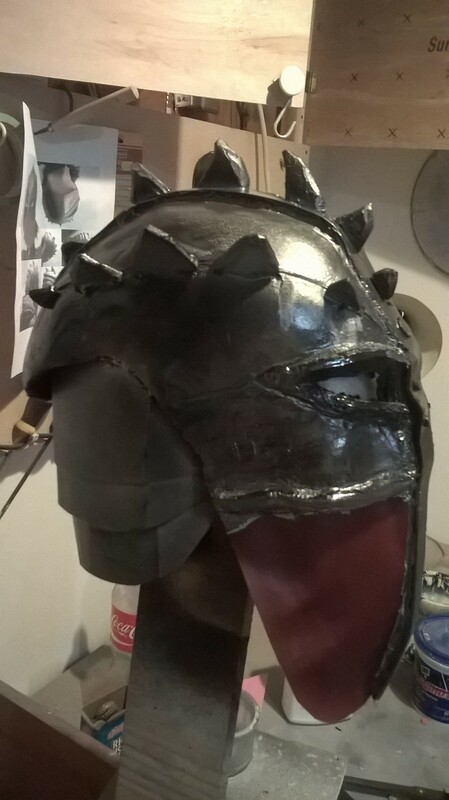 I wanted to build a Hiccup Helmet, and I did. 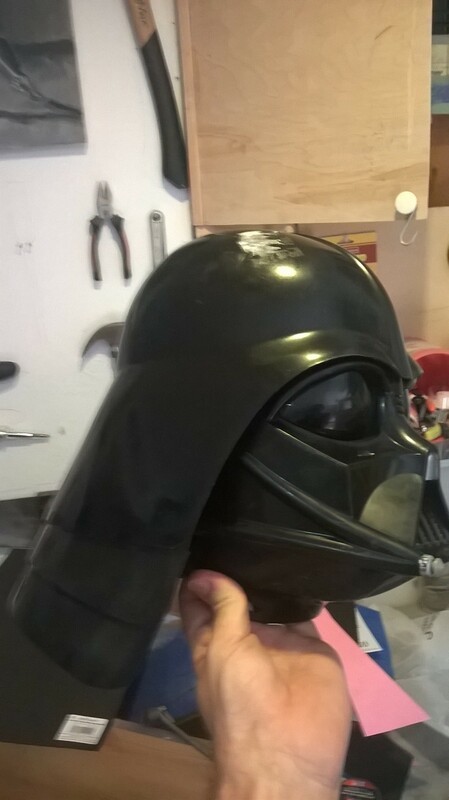 Now I’m building a Shakespearean Vader suit. They may not be the best, they may not be perfect, but they are real, and here, and they are here because I made them. It’s probably time I took some satisfaction in that achievement, instead of just hoping it’ll be better next time. See you at Fan Expo Vancouver. 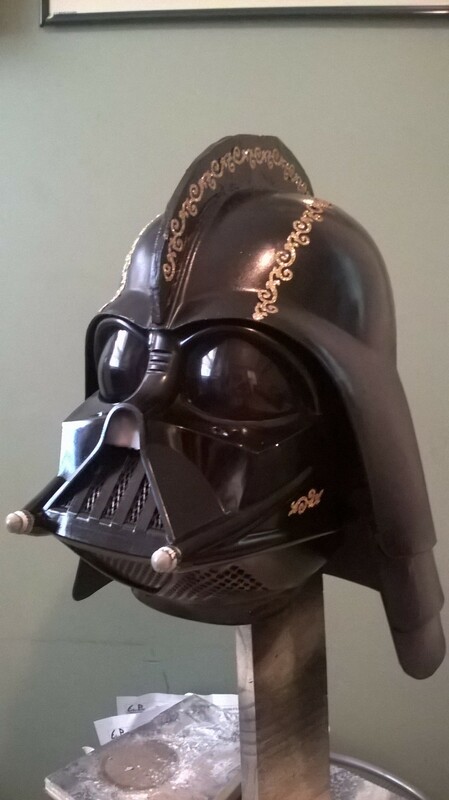 This entry was posted in Uncategorized and tagged cosplay, Darth Vader, Fan Expo Vancouver, Ian Doescher, Shakespeare, Shakespearean Star Wars, Star Wars, Vader, Vader costume. Bookmark the permalink.